Few perennials are as forgiving as daylilies. They tolerate dry, poor soils and extreme temperatures with aplomb, producing colorful blooms from late spring to late summer, depending on the variety. When necessary, they can be planted at any time. The best time to transplant daylilies is in early spring, as soon as the soil can be worked, or right after blooming, according to the University of Minnesota. Daylilies planted in spring may not bloom until the following year. Daylilies spread through underground rhizomes and require division every three to four years to keep the plants vigorous. Dig up the entire plant at the recommended planting times. Cut the foliage back to 5 to 6 inches high and gently pull it apart so that each section has two or three leaf fans. Use a shovel to pry very large root masses apart. Daylilies grow slowly from seed, so most gardeners use nursery-grown transplants or division. These hardy plants grow best in well-drained, slightly acid soils, in full-to-part sun. Once established, they tolerate drought and heat well. They spread quickly and will fill an entire flower bed within three to four years. Use clean, sharp shears to cut these beauties freely throughout the blooming season to enjoy in your indoor arrangements. Prune or pull yellow leaves from daylily plants throughout the season as they occur. Cut ragged leaves off about 2 or 3 inches above ground level all summer to maintain a nice appearance. Pick off wilted flowers the day after they bloom. Deadheading will keep the daylilies from producing seeds. It will encourage continuous summer flowering of ever-blooming varieties. This also keeps your plants looking tidier and more attractive. Cut flower stalks 2 or 3 inches above the base of the plant soon after deadheading. Prune daylily foliage back to about 6 to 8 inches tall in the heat of August. This will encourage maximum air circulation around your daylilies and help prevent diseases and insect infestations. Clean up all dead foliage and other plant materials in the fall prior to the first hard frost. This will go a long way toward preventing rot and reducing over-wintering diseases in your daylily beds. The activity will also send slugs and snails packing in search of more hospitable winter vacation resorts elsewhere. Go through the daylilies and snap off any old blooms with your fingers, making sure you get the seed head off as well. The seed head is at the very base of the flower. If you don't remove the seed head, it will eventually dry and split open, but generally the seeds are sterile--so it's much better to snip off the spent flower so a new one can develop. If there are no more blooms on a stalk, take a pair of clippers and snip it off at the very bottom, about an inch from its base. This will "trick" the flower into thinking it has lost a living stalk, so it will send up a new one. And new stalks mean new flowers. Remove any stalks that are already brown. Chances are you are too late for a new stalk to develop, but the less dead plant matter the better. Leave the green foliage on until it withers and turns yellow, at which time you should cut it back so that about six inches remain above the soil. The plant must absorb as much sunlight as it can, converted it to sugar and stored it in its tuber. The tuber will continue to grow fleshy roots underground during the winter using up some of the sugar while leaving enough to grow healthy plants in the spring. Mulch over the daylilies, especially in USDA hardiness zones 6 and colder. Mulch will help insulate the tubers underground and therefore keep them warm. Snow also insulates the tubers, but by mulching in the fall, you are maintaining soil temperature sooner when it is warmer and less heat is lost. Water your daylilies a few days before the first freezing frost. This will give the tubers one last water before the cold weather arrives. Choose one of the small-growing varieties of daylillies. Talk with your local nursery expert and choose a cultivar that is adaptable to indoor containers. Fill a container with a 50/50 mix of potting soil and manure or compost. Daylilies like well-drained soil that is high in organic nutrients. The container should be at least 50 percent larger than the current root ball or the current container to allow for growth. Dig a hole in the soil in your container that is large enough to accommodate all of the roots of your daylily. Place the plant in the hole and gently press the soil around the plant at the same depth as the plant was originally planted. Water well, until water begins dripping out of the drain hole in the bottom of the container. Empty the drain pan so the container does not sit in water. Keep the soil around your daylily moist, but not soggy. Daylilies do not like soggy soil. Lightly mist the foliage of your daylilies with water every day to provide them with some humidity. Place your daylily in a sunny window where it will get at least five to six hours of sunlight every day. Keep the temperature between 65 and 75 degrees Fahrenheit during the day and do not let nighttime temperatures drop below 60 degrees Fahrenheit. Weed the area around the daylilies in the early spring, before any new plant growth. Cut any dead foliage from the previous year's growth with a pair of sharpened and sterilized pruning shears. Water daylilies regularly to keep the surrounding soil moist to the touch. Provide daylilies with at least 1-inch of supplemental irrigation each week when rainfall is insufficient. Apply supplemental irrigation directly to the soil, rather than to the plant itself, to prevent the foliage from rotting due to excessive moisture. Fertilize daylilies once each year, in the early spring, which will give the plant the nutrients it needs to thrive all season. Feed daylilies a balanced water soluble chemical fertilizer, or organic fertilizer such as manure, compost or alfalfa meal. Remove seed pods and spent blossoms throughout the growing season. This will encourage the daylilies to produce additional blooms and prevent them from producing seeds. Daylilies allowed to produce seeds will have noticeably fewer blossoms the following growing season. The daylily plant and its flowers are not poisonous to dogs, according to the American Society for the Prevention of Cruelty to Animals. 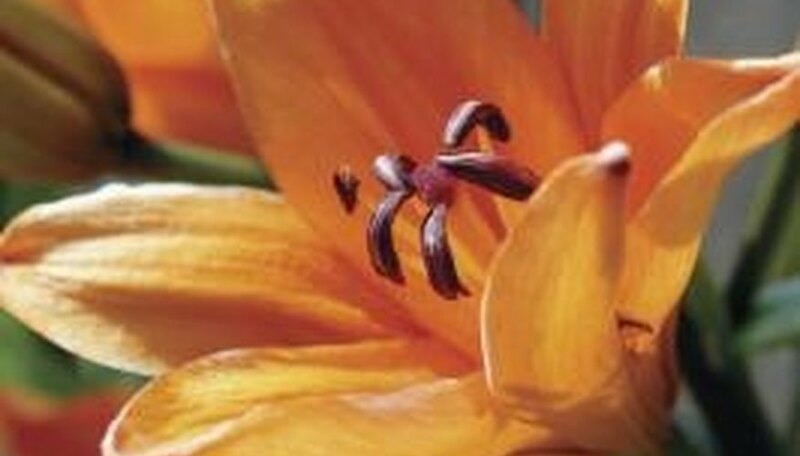 Your dog could get an upset stomach from eating an unfamiliar food, but daylilies pose no toxic danger to it. If you are planting daylilies in your yard, take care to keep your dog away from the rhizomes. While the plant will not injure your dog, the daylily bulbs are more likely to make it ill if they are ingested, according to "Who Moved My Bone?," a guide to owning more than one dog. While daylilies are not poisonous for dogs, they are toxic to cats. If you have cats in your household and they eat the leaves of the lily, they could die of kidney failure. If your dog experiences excessive vomiting, drooling or muscle tremors after eating any plant, contact your veterinarian right away. Bring a portion of the plant into the office to help your veterinarian determine a course of treatment. Water daylilies adequately. Daylilies require a minimum of 1 inch of water per week to produce healthy blooms. Place mulch around the base of the plant. This helps the soil to retain its moisture between waterings. Provide adequate sunlight. Daylilies need five to six hours of sunlight per day to remain healthy. Divide clumps of daylilies that are three to five years old. Reduced blooms are often a sign that division is necessary. The best time to divide is in the early spring or late summer. Apply a liquid fertilizer to the leaves. 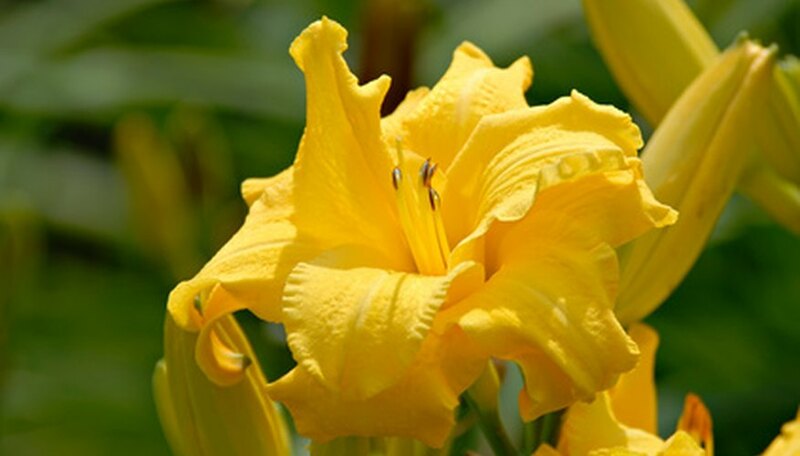 The addition of a nutrient-rich fertilizer will help the daylilies produce blooms. Remove the seed pods from expired blooms. When the seed pods are removed, the plant stores the nutrients that would have been channeled to the pods back into its roots, ensuring the daylilies have adequate nutrients to produce blooms the next flowering season. Dig a trench around the area where the daylilies are growing. Use a shovel or spade. You don't have to make the trench deep, just about 6 inches. Cut the daylily foliage down with a pair of sharp pruning shears or clippers. Leave about 1 inch of foliage above the ground. Spread a large tarp out on the ground beside the area where you're working. Stand outside the trench and start digging inward and downward, scooping down and lifting out clumps of dirt and daylily corms. Dig down at least 12 inches, because, according to the folks at Dayton's Nurseries, daylilies often form root systems that deep. Lay the dirt and daylilies down on the tarp as you lift them out. Continue digging and removing corms until you've dug up the entire area. Go over the area with a rake and remove any more corms you find. Sort through the pile on the tarp; remove the daylily corms, then replace the dirt in the area or use elsewhere in your garden. Store the daylilies in a cool, dark place or plant them (in fall) in another area, or give them away to gardening friends. Mow the foliage down to the soil level early in the spring so that as little foliage remains on the plants as possible. Cover the entire daylily area with two sheets of thick black plastic sheeting. The plastic sheeting will prevent the daylilies from receiving both air and sunlight and should starve the daylilies of these necessary nutrients. Cover the black plastic sheeting with a foot of straw or hay mulch. Keep the area covered until the next spring and then remove the mulch and the plastic to assess the area. Pull up any foliage you find and dispose of it. If the growing area seems to be free of daylilies, cultivate the area and replant as desired. If you find surviving daylilies, repeat steps one through three to finish removing the remaining daylilies. Choose a site that is full sun to partial shade for dwarf daylilies. You'll get stronger growth and more flowers in full sun, but lilies will live happily in partially shaded areas as well. Dwarf daylilies need well-drained soil. Dig up the area in which you want to plant the lilies and analyze what you need. If the soil is very light, the Reader's Digest All-New Guide to Gardening recommends adding an organic compost mix. If the soil is very heavy, with lots of clay, mix in some coarse sand to keep it from being water-logged. You can also add fertilizer and topsoil if you'd like to give your lilies a little treat. Plant dwarf daylilies in the fall for spring flowers. Plant after the weather begins cooling but before the ground begins freezing. Place the daylily bulbs six inches below the surface with the pointed ends facing up. Space the bulbs so there are about six inches between them. Cover with soil and pat down gently. Label the area so you don't forget where you planted. Choose a well-drained sunny location. If a well-drained area is not an option, then raised beds can be used. Daylilies will bloom in partial shade, but with at least 6 hours of full sun, the flowers will appear in greater abundance. Test the soil pH level. Daylilies grow best in a soil pH level between 6.0 and 6.5. Soil pH test kits can be purchased at large home and garden centers or through your local nursery. Your local Cooperative Extension Office may be able to direct you to labs in your area that conduct soil tests for more comprehensive results (see Resources). Soil pH levels can be raised, if needed, by introducing lime into the soil according to the manufacturer’s directions. Add about 2 inches of organic matter (compost, leaf mold or commercial organic compound) as you dig down 12 inches. Plant the daylilies at least 24 inches apart. A slow-release fertilizer in a 10-10-10 mix can be applied in the spring. Water after applying the fertilizer. Add 2 to 3 inches of mulch to help block weeds and retain moisture. Enjoy your daylilies during the summer while they bloom. During the bloom time, cut stems and bring them inside to enjoy fresh-cut flowers in the house. Pull off spent blooms or wilted leaves to keep the plant looking neat. Cut daylily stems back in fall, leaving 4 to 6 inches above the ground. Discard the clippings in a compost bin or garbage. If you accidentally scatter daylily seeds while cutting back the stems, you'll sow new daylilies throughout your garden. Mulch over the cut daylilies with a 3-inch layer of pine straw or mulch. This protects the bulbs during the winter. Clear away the mulch in the spring to find new growth emerging in your daylily bed. Discontinue watering the daylily at the season’s first hard freeze. Refrain from cutting back the daylily’s leaves as winter approaches. Foliage acts as a natural insulation for the plant. Apply a 4- to 5-inch layer of light mulch (pine needles or straw, for instance) over the daylily immediately following the first hard freeze. Remove the mulch in the spring after all danger of frost has passed. Water the daylilies whenever the soil feels dry, up until the first hard freeze of the season. This will help ensure that the root system is healthy enough to withstand winter. Cut the foliage back to within 5 to 6 inches of the ground. You can do this any time after the leaves have begun to dry and turn brown. Add a 3-inch layer of organic mulch around the daylilies. Check the plants throughout the winter to make sure that the covering hasn't been disturbed. Replace the mulch as necessary. Remove the mulch in spring, after all danger of frost has passed.